For our quick teaser at Easter we showed the above photograph and asked where is the 'disc' and what's it all about? Unfortunately webwatchers drew a blank with this one. It seems Coseley's Victorian poet, John Cornfield, is no longer in vogue. 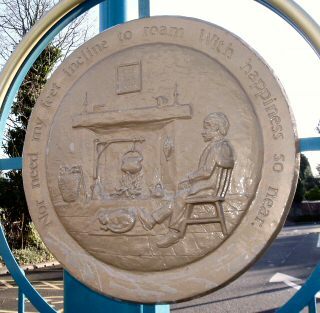 The roundel, with an appropriate illustration, is edged with words from his poem 'Home'. A sequence of roundels form the entrance to the park and ride area for the mainline railway station a quarter of a mile away. The Gough Road sculpture in Coseley was erected in the 1990s based on design and research work undertaken by Steve Field (Dudley's Borough Artist). Congratulations to Yampy webmaster, Martin Reeves for identifying the location of our Winter scene. Read a brief history of the threatened Straits House here. Our local comunity news site - Yampy - is keeping tabs on this developing story.